John F. Kennedy statue in Fort Worth, Texas honoring the former president on his November 1963 visit there, prior to his tragic assassination in Dallas on that same trip. On the fateful day of November 22nd, 1963, when President John F. Kennedy (JFK) was assassinated in Dallas, Texas, he and his wife, Jackie, had also visited another Texas city earlier that same day – Fort Worth, Texas. Fort Worth is the twin city of Dallas, commonly known today as the Dallas-Fort Worth metro area. But in 1963, Fort Worth would become the place where John F. Kennedy made his last two speeches. The president had come to Texas as part of some early politicking for his planned 1964 re-election bid — Texas being a key state in the electoral math. Kennedy was also then making a larger tour of western states, sounding out some possible campaign themes, including education, conservation, and national defense, among others. But in Texas at that time there was also a bit of a rift in the Democratic party. JFK’s civil rights and foreign affairs policies were not popular among Texas conservatives. A month earlier in Dallas, U.S. Ambassador to the United Nations, Adlai Stevenson, had been roughed up by a crowd after making a speech there. So Kennedy had come to Texas, in part, to do some fence-mending and also to gin up popular support for his party prior to 1964. On the Texas trip – which had scheduled stops in five cities over two days – JFK was accompanied by his wife, Jackie, who was making her first public appearance since the August 9th death of their two-day-old baby, Patrick. The first stops on the trip were San Antonio and Houston on November 21st, 1963, where the president made a series of speeches. They then came to Fort Worth later that night. Map shows JFK’s 2-day Nov `63 itinerary: San Antonio, Houston, Fort Worth, Dallas, Austin, then back to D.C.
After a scheduled speech in Fort Worth the next morning, November 22nd, the president and his party would then take a short flight to Dallas for the day, then to Austin, the final stop. Following the Austin visit, the Kennedys were scheduled to spend the weekend at Vice President Lyndon Johnson’s Texas ranch near Johnson City, Texas and then fly home to Washington thereafter. But the tragic events in Dallas intervened in the latter events. After their first two visits on November 21st, the Kennedys arrived at Ft. Worth’s Carswell Air Force Base at 11 pm. Despite the late hour, cheering crowds greeted them at the airport and all along their route to downtown Fort Worth, where the Kennedys would spend the night at the Texas Hotel. Local art patrons, knowing JFK and Jackie were both art lovers, assembled a sampling of art pieces from Fort Worth collectors and installed what amounted to a private exhibit in the President’s hotel suite. Sixteen original pieces of modern art and sculpture were installed, including works by Van Gogh, Monet, Picasso and others. A special catalog, “An Art Exhibition for the President and Mrs. Kennedy,”listed the details on each piece and their owners. The next morning, The Star-Telegram ran the front-page banner headline: “Welcome, Mr. President!” with sub-heads: “JFK Lands Amid Roar of Cheers” and “Crowd Lines Route to Town; 10,000 Welcome President.” That morning, the president was scheduled to speak at a breakfast gathering of civic leaders of the Forth Worth Chamber of Commerce. Despite an earlier rain and misty conditions, a huge crowd of Texans had gathered outside the hotel hoping to get a glimpse of the President. Against the advice of Secret Service, an impromptu speech was hastily arranged in the parking lot outside across the street from the Texas Hotel, using a truck bed for a speaker’s platform. Congressman Jim Wright of Texas, traveling with the president that day, had previously been pushing the White House to allow a short public speech in Fort Worth in addition to the President’s scheduled Chamber of Commerce speech later that morning. Fort Worth, Texas: At approximately 8:45a.m. on the morning of November 22, 1963, President John F. Kennedy delivered a short speech to thousands of Texans in downtown Fort Worth prior to his formal speech inside the Texas Hotel before the Fort Worth Chamber of Commerce. Rep. Jim Wright is standing just beyond JFK. On his Texas trip, the president was traveling with a group of Texas dignitaries that included, in addition to Congressman Wright: Vice President Lyndon B. Johnson, Texas Governor John Connally, U.S. Sen. Ralph W. Yarborough, Texas state senator Don Kennard, and others. These officials appear in the Fort Worth photo above and some of the other photos of the same speech below. The president was quite encouraged by the large crowd that turned out that morning, and he thanked them for coming out in what had been a rainy morning. Nov 1963: JFK with Rep. Jim Wright in Fort Worth, Texas. President John F. Kennedy addressing Fort Worth ,TX crowd on the morning of November 22, 1963 outside Hotel Texas. JFK looking out over crowd and downtown Fort Worth, Texas during speech on the morning of November 22, 1963. JFK in Fort Worth with Sen. Ralph Yarborough, Gov. John Connally and Vice President Lyndon B. Johnson behind him. After his Fort Worth speech, JFK plunged into the crowd. At about 8:45 a.m., President Kennedy, with Congressman Jim Wright at his side, strode out of the hotel, also flanked by Vice President Johnson and Senator Ralph Yarborough, with Governor Connally a few steps behind. Johnson, Yarborough and Connally all wore raincoats, as the skies were still overcast. Kennedy and Wright were in their suit coats. Jackie Kennedy had remained behind in the hotel suite. Kennedy received rousing cheers and prolonged applause throughout this speech, and was generally greeted enthusiastically by the large crowd. He then plunged into the crowd for a time, shaking hands and thanking folks for coming out. President Kennedy greeting citizens of Fort Worth, Texas who just heard him make a brief speech in front of the Hotel Texas on the morning of November 22, 1963. Photo by White House photographer, Cecil Stoughton. Next it was on to a more formal speech inside the Hotel Texas addressing an audience of about 2,000 civic, business, and labor leaders at a breakfast meeting of the Fort Worth Chamber of Commerce. Tickets for this event had vanished well in advance of Kennedy’s appearance, as demand for tickets had outstripped the capacity of the hotel’s ballroom. Among the political and business leaders in the room that morning were Vice President Johnson, Governor Connally, U.S. Senator Yarborough, and Rep. Jim Wright. Also attending were: Byron Tunnell, Speaker of the Texas House of Representatives; Waggorier Cart, Texas Attorney General; Raymond Buck, president of the Fort Worth Chamber of Commerce; and Marion Hicks, a vice president of General Dynamics in Fort Worth and also vice president of the Fort Worth Chamber of Commerce. Jackie Kennedy, center, in light suit behind agent, making her entrance at the Hotel Texas to join JFK at the head table. Jackie Kennedy at the head table between JFK and Lyndon Johnson, left, and official of the Fort Worth Chamber of Commerce, at the podium. President Kennedy during his speech to the Fort Worth Chamber of Commerce at the Hotel Texas, Nov. 22, 1963. As the guests at the head table were taking their seats, JFK, according to Jeb Byrne, Kennedy’s advance coordinator for the Fort Worth visit, called one of the Secret Service agents over to the head table and told him to ask Mrs. Kennedy to come down to the ballroom. He also instructed the agent to ask the orchestra to play “The Eyes of Texas Are Upon You” when she made her entrance into the ballroom. Jackie arrived, escorted by two agents, and she was dressed in a striking pink suit and matching pillbox hat – an outfit that would later become a painful symbol of one of the nation’s most horrible days. But at this moment, Jackie Kennedy was the center of attention and received a rousing welcome and audience ovation as she joined JFK at the head table. It was a speech written for a Texas Chamber of Commerce audience, and they loved it. Following the speech, the President and Mrs. Kennedy walked down the main aisle shaking hands and engaging members of the audience for a few minutes before Secret Service agents guided them on a security-cleared route back to their hotel suite. In the hotel suite, with some time to catch their breath before departing for Dallas, the president made a few telephone calls, one to former Vice President, John Nance Garner, at his home in Ulvade, Texas, to wish him a happy 95th birthday. Garner had served as vice president in FDR’s first two terms in the 1930s. The Kennedys also took some time to view the original art works adorning their suite, placing a call to one of the of exhibit’s organizers, Ruth Carter Johnson, to thank her for her thoughtfulness. Front page of the New York Times on November 23, 1963 includes photo of LBJ being sworn on Air Force One in with Mrs. Kennedy beside him. The presidential party then left the hotel by motorcade to Carswell Air Force Base for the 13-minute flight to Dallas. A short time later, the national horror of a presidential assassination would plunge the nation into a period of shocked disbelief and prolonged national mourning, as assassin Lee Harvey Oswald shot the president while he was riding in an open limousine along with Jackie and Governor Connally. Arriving at Love Field in Dallas that morning, the President and Mrs. Kennedy engaged in some brief welcoming activities before entering their limousine. The JFK motorcade proceeded along a 10-mile route through downtown Dallas on its way to the Trade Mart, where the President was to speak at a luncheon. At approximately 12:30 p.m. on November 22nd, 1963, the President was struck by two bullets. Shortly thereafter, at about 1:00 p.m., he was pronounced dead at Parkland Hospital. Lyndon Johnson was sworn in on Air Force One with Mrs. Kennedy beside him in her blood-stained pink outfit that only hours earlier had dazzled a Fort Worth breakfast audience. After that tragic day, America would never be quite the same, as a measure of innocence was lost with the President’s assassination. John F. Kennedy was 46 years old. Earlier artist’s rendition of the JFK Tribute Site in downtown Fort Worth, Texas at General Worth Square Park. JFK Tribute site in Fort Worth, TX as of November 2012. 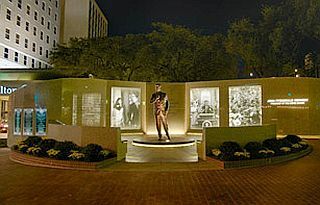 Another view of the JFK statue at the Fort Worth, Texas JFK tribute site at General Worth Square, downtown, set against large period photographs of the President’s 1963 visit. JFK Tribute Site with night lighting, located near the Fort Worth Hilton Hotel (formerly, the Hotel Texas in 1963). After JFK’s assassination, cities and towns across the country sought ways to honor the fallen president, and a number of place-name designations followed bearing the JFK or Kennedy moniker. Schools, streets, parks, airports, public buildings and more were named for the fallen president. In Fort Worth, too, an effort to memorialize Kennedy began in early 1964, when a group of local women pushed to have the city acquire the parking lot where Kennedy spoke, name it for him, and turn it into a public square. However, that effort failed, but the women tried again after a local bond issue passed to build a new convention center downtown. This time some 10,000 signatures were gathered for a petition seeking to name the new convention center after JFK. The county commissioners rejected that idea too, but they later agreed to name the theater inside the convention center for Kennedy, installing a small bronze plaque near the box office with the title, The John F. Kennedy Theater. By the year 2000, however, that theater was razed in the construction for an expanded convention center. Meanwhile, the parking lot where Kennedy had given his November 1963 speech was turned into a public square, named for the city’s fortifier and founder, General William Jenkins Worth. 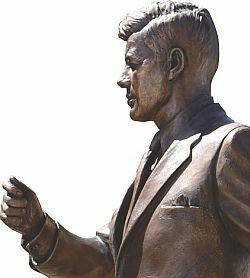 In 1999, plans were begun to include a Kennedy memorial on that site under the direction of the JFK Tribute Committee of Downtown Fort Worth Initiatives Inc. By 2001, Texas sculptor Lawrence Ludtke had created an eight foot statue of JFK, which was cast in bronze in 2009. In that same year, the Fort Worth City Council authorized an agreement with Downtown Fort Worth Initiatives Inc., for improvements to General Worth Square Park, including the JFK Tribute site, approving $250,000 in spending. In January 2011, Taylor and Shirlee Gandy, co-chairs of the JFK Tribute Committee, with the backing of Downtown Fort Worth Inc., started a $2 million public fundraising effort. Dozens of prominent residents, foundations, and trusts contributed to the project, among them: the Gandys, Bob and Janice Simpson, Downtown Fort Worth Inc., the Martha Sue Parr Trust, the Jane and John Justin Foundation, Tarrant Co. Commissioners Court, and the Ann L. and Carol Greene Rhodes Charitable Trust. The tribute site was dedicated at a public ceremony in November 2012. The site is centered on the JFK statue and includes a 2,000 square foot granite plaza backed by large wall with 6-ft. x 8-ft. photographic panels depicting scenes from 1963, along with other panels with selected historic quotes. The JFK site also includes a water wall, night lighting, and extensive landscaping. Audio tours of the site are available as are downloadable transcripts of JFK’s 1963 Fort Worth speeches by mobile app or from the JFK Tribute website. The Ludtke treatment of Kennedy in the statue presents the president in a gesturing, positive mode. “His posture is pressing forward,” explained Andy Taft, the president of Downtown Fort Worth Initiatives, “and Ludtke considered that a very optimistic pose for the president – moving forward, pressing with optimism into the future.” That is consistent with JFK’s message that day in his Forth Worth speeches, as he spoke about the importance of a strong U.S. economy, The Tribute site seeks to honor the positive ideals and themes of JFK’s final speeches. the space program, military preparedness, and U.S. leadership. At the November 2012 ribbon-cutting and dedication ceremony, a number of Texas politicians and local officials were on hand to lend their support for the site, including Fort Worth Mayor Betsy Price, former House Speaker Jim Wright, former Fort Worth Mayor Bob Bolen, and various Fort Worth City Council members. The JFK Tribute site exists, according to the Tribute Committee, to honor the positive ideals and themes of the President’s historic final speeches. “President Kennedy’s vision and the impact of his leadership are as relevant today as they were in 1963,” said Taylor Gandy, JFK Tribute Co-Chair at the site’s dedication. The tribute is also about Fort Worth and its people, then and now. Profile view of JFK statue in Fort Worth, Texas. But now, thanks to the persistence and generosity of Fort Worth citizens, both Kennedy’s ideals and Fort Worth’s enthusiasm for a nation’s young president are set in a worthy public display. For additional stories at this website on Politics & Culture, or Icons & Celebrities, please visit those category pages, or go to the Home Page for other choices. Additional stories at this website related to Kennedy family history are listed below in Sources. Fort Worth, Texas newspaper headline of November 21st, 1963 announcing visit of President John F. Kennedy. Welcoming Fort Worth residents await late night arrival of President Kennedy at Carswell AFB, 21 Nov. 1963. Photograph of JFK’s outdoor speech in Fort Worth, TX, also showing (behind JFK, l-r), state senator Don Kennard, Sen. Yarborough, Gov. Connally, and v. p. Lyndon B. Johnson. President John F. Kennedy welcoming his wife, Jacqueline, to the head table in Forth Worth, Texas, November 22, 1963. President & Mrs. Kennedy greeting Fort Worth police force on departure to Dallas from Carswell AFB, 22 Nov 1963. 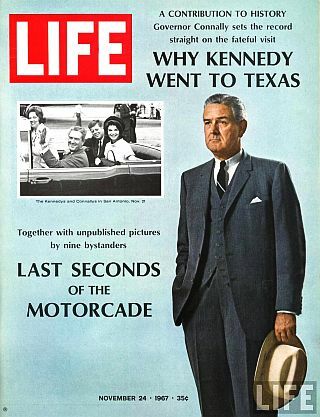 Cover of November 1967 Life magazine featuring Kennedy related story by former Texas Governor, John Connollly, who rode with JFK in Dallas and was also shot on November 22, 1963. “November 22, 1963: Death of the President,”JFKlibrary.org. “Welcome, Mr. President! JFK Lands Amid Roar of Cheers; Crowd Lines Route to Town; 10,000 Welcome President,” Fort Worth Star-Telegram, November 22, 1963. Tom Wicker, “Kennedy Pledges Space Advances; Opens Texas Tour… Declares Research ‘Must and Will Go On’ …Party Split Evidenced; Yarborough Scores Connally…,” New York Times, November 22, 1963, p. 1. “JFK’s ‘Parking Lot’ Speech in Fort Worth, Texas” (November 22, 1963), You Tube.com, audio track comes from the archives of Fort Worth radio station WBAP (length 10:30). “JFK Outdoor Fort Worth Speech, November 22, 1963,” JFKtribute.com. President John F. Kennedy, “Remarks at the Breakfast of the Fort Worth Chamber of Commerce,” November 22, 1963, The American Presidency Project. “The Last Two Days, November 1963: 21-22,” JFKlibrary.org (video, 19:22). “Fort Worth OKs Funding For Kennedy Statue,” Star Telegram (Forth Worth, TX), September 9, 2009. Frank Heinz, “FW Erecting JFK Statue in Downtown Square; Statue to Commemorate President’s Visit, Final Night,” NBC (Fort Worth), Tuesday, January 25, 2011. Ray Sanders, Commentary, “JFK Gets a Fitting Tribute in Fort Worth, Fort Worth Star-Telegram, January 29, 2011. James Ragland, “Fort Worth’s JFK Tribute Forever Links Cowtown to Camelot,” Dallas News, November 7, 2012. Stephen Becker, “Fort Worth Unveils New JFK Tribute,” ArtandSeek.net, November 7, 2012. Sandra Baker, “Long-Overdue JFK Tribute Dedicated in Fort Worth,” Star-Telegram (Ft. Worth), Thursday, November 8, 2012. “Fort Worth Flashback: JFK’s Speeches in Fort Worth Would be His Last,” City News, November. 19, 2012. Stephanie Stegman, “‘No Faint Hearts in Fort Worth:’ Public Art and Memory in the JFK Tribute,” Ultimate History Project .com. “JFK Statue: Fort Worth Worthy,” Orwell Today.com. “JFK’s 1960 Campaign, Primaries & Fall Election” (with city-by-city itinerary and extensive photos), PopHistoryDig.com, July 20, 2014. “Kennedy History: 1954-2013” (topics page with thumbnail links to additional Kennedy stories), PopHistoryDig.com, November 10, 2013. “The Jack Pack, 1958-1960,” (Pt. 1: Frank Sinatra, Rat Pack & JFK campaign), PopHistoryDig.com, August 21, 2011. “The Jack Pack, Pt. 2: 1961-2008,” (Part 2: Rat Pack & JFK inauguration, etc), PopHistoryDig.com, August 21, 2011. “JFK, Pitchman?, 2009,” (John F. Kennedy in Omega watch ad), Pop HistoryDig.com, August 29, 2009. “RFK in Brooklyn, 1966-1972″(Robert F. Kennedy history, legacy, statue/bust), PopHistoryDig.com, July 20, 2009. “1968 Presidential Race: Democrats” (includes section on RFK campaign), PopHistoryDig.com, August 14, 2008. “JFK’s Profiles in Courage, 1954-2008″ (history of JFK book, 1950s politics & legacy), PopHistoryDig.com, February 11, 2008.